This hairpiece, made of 100% Memory®Hair , is easy to apply without damaging the natural hair. The transparent strand rests on the head, not on the hair and holds the hairpiece perfectly in place without the risk of slipping out. 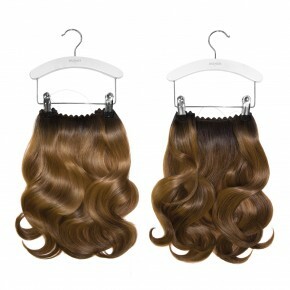 The Hair Dress contains multiple wefts, including one patented Soft Blend Edge for perfect integration. The Hair Dress ombré colors can be worn on both sides, a sunrise side with a lighter shade and a sunset side with a slightly darker shade. The Hair Dress Memory®Hair 45 cm is available in 4 ash tones (Oslo, Moscow, Chicago, Dublin) and 9 ombré colors (Stockholm, Amsterdam, New York, L.A., London, Sydney, Barcelona, Milan, Rio). As the natural hair color adapts to every season, it becomes lighter in the summer and darker during the winter, the Hair Dress ombré colors are developed with a “Sunrise” and “Sunset” side. The Sunrise side is layered with a lighter shade and the Sunset side has a darker shade. The Hair Dress is perfect for volume and lengthening services. Suitable for all hair types, but due to the risk-free application ideal for fine or damaged hair.